This is the second movie dealing with Snow White to come out this year. The movies have a few similarities, but they are very different movies overall. I wasn't sure about this one when I first heard about it. After seeing some trailers, I decided I wanted to see the movie. This is a darker version of the story of Snow White, and even the locations look darker. In this version, Snow White has been locked away in a tower. When she realizes that the Queen means to have her killed, she manages to escape. The Queen forces a Huntsman who knows the dark forest to go after her. The two of them have to work together to stay alive. This Snow White doesn't wait around to be rescued. She rides into battle to deal with the Queen. It is a little difficult to buy how wonderful she is and that so many are willing to follow her, but I think that is mainly from the way Kristen Stewart plays the part. She is a bit better here than she has been in the Twilight movies, but not enough. She still uses some of the same expressions and mannerisms she uses as Bella. I just don't think she was right for the part. The Huntsman is an interesting character and he ends up with a lot to do. The Prince is around, though he doesn't do as much and I'm still not even clear on if he is an actual Prince in this version. Several basic things about the story are the same, though there are one or two interesting changes. The pace is a little slower, but not too slow. Unfortunately, there is some jerky camera work in a few places. 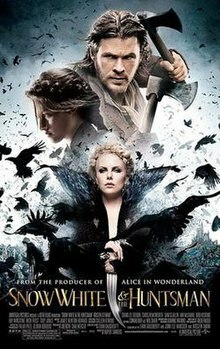 Overall, this is an entertaining movie and an interesting version of the Snow White story. I have read that a sequel is now in the works. I'll probably see it, though with how this one ended, I'm not sure where the story will go next. I did get a longer review posted on Epinions.com.